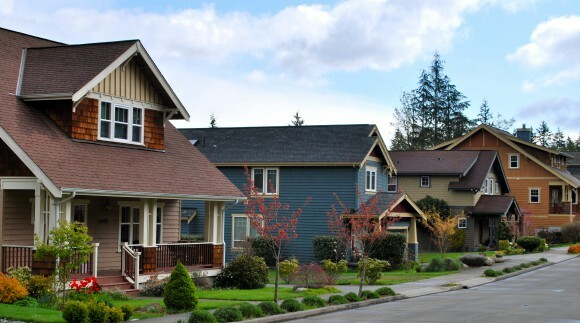 The North Town Woods Neighborhood on Bainbridge Island. It’s election season, which means we hear assertions from candidates that sometimes warrant a bit of fact-checking. The same rules apply to real estate. At Windermere Bainbridge, we’ve heard a lot of mis-perceptions and embellishments about the state of our local market. “The bubble is bursting!” “Prices are being slashed!” “Prices are going up!” “Our market has peaked!” “Our market has gone crazy!” We’ve heard all this and more. So we’re here to set the record straight. Think of us as your real estate fact checkers. The fact is we are in the midst of a very healthy (not crazy) market that is moving in a manner we have been predicting for some time. Let’s explore the specifics. FACTS: We have said for some time that the lack of inventory was holding our sales in check. When we started the 2016 business year (on January 4th to be exact), there were 53 houses available on all of Bainbridge Island. The first quarter ended with only 47 homes available. This lack of choices crippled sales and reflected a 21% drop from first quarter 2015 sales. But this lack of inventory also helped push prices up, bringing more sellers into the market. Consequently, our inventory began to grow, which meant sales did too. By the end of the second quarter, inventory had grown to 92 homes. (Still low compared to Q2 2008 when we had 291 homes available, or to 2012 when the recovery had set in and we had 189 homes available.) Our year-to-date sales number also dropped from 21% down to 15% by the end of the second quarter. Now, with the third quarter wrapped up, our available inventory is 98 homes (compared to 77 last year at this time) and the number of third-quarter sales rose by almost 5%. Hardly a sign of a decreasing market. FACTS: It’s true we are experiencing price reductions. This is a normal phenomenon created by sellers being unrealistically optimistic and buyers being informed and disciplined. The demographics of our marketplace bring more experienced buyers than many other markets. They are informed, know the risks of overpaying, seek professional advice and are careful. It’s like the old expression, “It’s the seller’s job to ask and the buyer’s job to say no.” Here also, sellers who seek (and listen to) competent professional advice in pricing will often experience less disappointment, along with a quicker and often more profitable experience. (There are reams of data showing that properly priced homes net more than overpriced homes that adjust downward.) Prices are still rising. The median price is up 17% from last year. The median price of homes sold during the third quarter this year was $765K, compared to $648K last year. This strength is reflected in the shift of sales in specific price ranges. There were 47 sales below $600K in the third quarter last year, but only 35 this year. Conversely, sales over $600K grew from 61 in 2015 to 78 this year! This indicates a shift upward in the prices of all homes. Hardly a sign of falling prices. 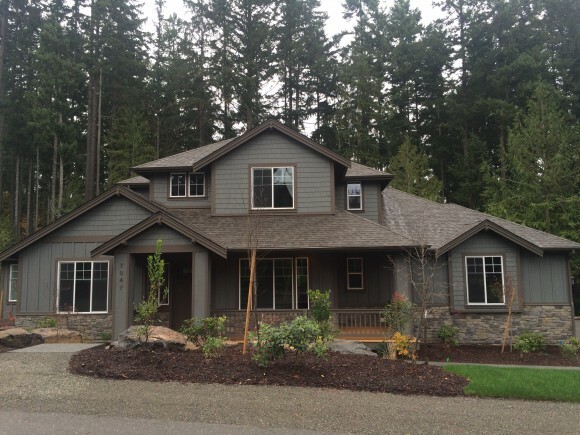 A new home built by Freestone, in the Stetson Ridge Neighborhood, on Bainbridge Island. FACTS: Developers from all over the nation are eagerly investing in our market, which is also a signal of strength. Two new home projects are currently being marketed in Wing Point and a project by DR Horton is under construction on Wyatt Way. The “Roost,” Grow Village Phase 3 and another DR Horton project at Torvanger/Sunrise are coming out of the ground. The long anticipated project at Pleasant Beach Village will start next month and another neighborhood at Weaver and Finch are in the planning/design phase. These projects will continue to bolster inventory and provide our healthy buyer pool even more choices. Hardly a sign of stagnation. 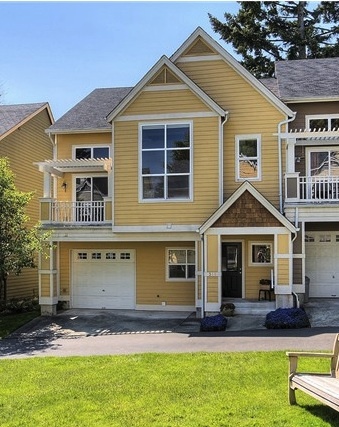 A townhome/condo in The Winslow Mews on Bainbridge Island. FACTS: Our condominium market is experiencing similar strong activity. At the end of the third quarter last year there were 5 active condominium listings; this year there were 26 available. Last year, 25 condos sold during the third quarter; this year 42. And prices are up over 8%. As home prices continue to rise, condos provide attractive alternatives. Pleasant Beach and Grow Phase 3 are both great examples of single family home alternatives in areas where services and amenities are concentrated. They are both examples of our comprehensive plan to enable growth while maintaining our rural feel. Hardly a sign of a weak market segment. We are very happy with our current conditions and don’t see anything on the horizon that would likely disrupt the trend in the near future. Crystal balls are dangerous (we certainly learned that in 2007/2008) but our region shows every indication of continued strength. Seattle is strong and more and more people are trying to escape from the challenges of its growth. Kitsap is also strong, with sales up and growing. Barring some big surprise, we see strength continuing at least through next year. 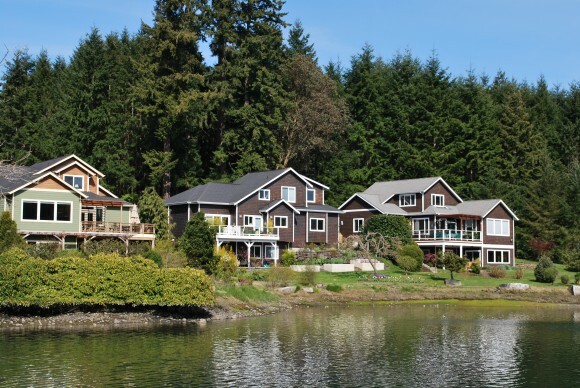 The Bainbridge real estate market is looking good, and that’s a fact!